Redingotte of green satin. The corsage of this dress which is made high in the neck is tight to the bust and quite plain, having a seam down the centre of the front, and those deep plaits or gores (to make it sit) at back side. The sleeves are tight all the way down, but have only one seam, they are finished at the wrists with very deep fur cuffs. 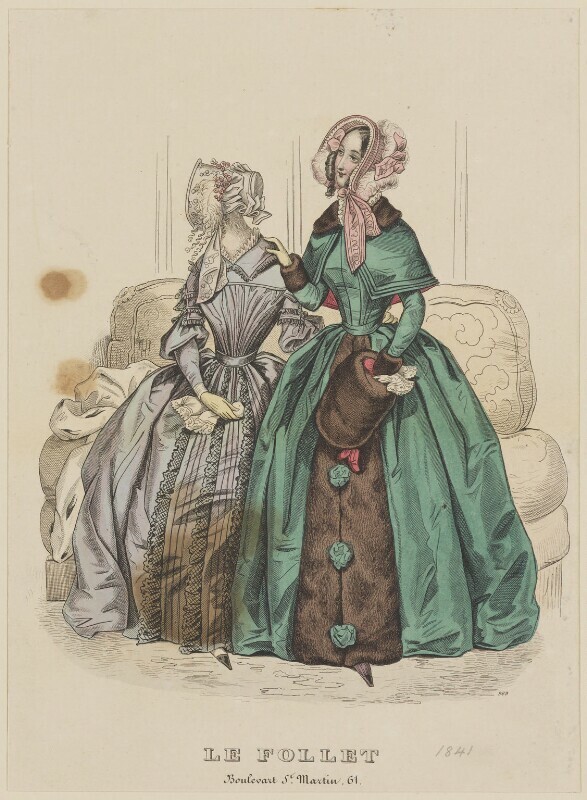 The pelerine of the same material of the dress is large; it is rounded at back, but squared off in front where it does not close, it wholly covers the upper part of the arm; it is edged with three small tucks (de biais) cut on the cross way of the satin; and, as well as the dress itself, is wadded and lined with rose color silk. The pelerine has a deep collar of fur turned down. A broad trimming of the same fur goes down the front of the skirt of the dress, which is likewise fastened by three or four full rosette bows, of satin. Drawn capotte of pink velours épinglé, ornamented with plumes nuancées and bows of velvet ribbon. A ruche of tulle (blonde) is put round the inner edge of the front. This capotte it will be perceived is by no means large, it sits rather close to the face, but not unbecomingly so, and the strings being placed inside prevent the bonnet appearing too long at the sides. The muff, lined with rose color silk, matches the trimming on the dress. The hair is in long ringlets à l'Anglaise, lace frill cambric handkerchief, pale yellow kid gloves, purple half boots. The second figure in carriage or visiting costume, has a dress of poux de soie glacé, gorge de pigeon. It has what is called a corsage à pièce. The top piece is plain, like that of a peignoir, with the exception, that the present one fastens at back, and that a peignoir always opens in front. The lower part of the corsage is full, both at back and front. And there is a revers at top, that wholly takes from the unbecoming plainness of the top piece. The sleeves which are very pretty are full at top and tight to the lower part of the arm, they are ornamented with epaulettes, which, as well as the revers are trimmed round with narrow black lace. Three rows of black lace, beginning narrow at the waist and increasing gradually in width as they go down, ornament the front of the skirt of the dress; between each two rows of the lace, are three rows of small silk cord or passementerie trimming; it may be remarked, that the three falls of lace all turn to the same side. Hat of velours épinglé, ornamented with a willow feather drooping low to the side, and retained by a bouquet of velvet flowers which crosses the top of the front of the hat. The trimming consists of puffings of velvet. Lace frill, cambric cuffs and handkerchief, yellow gloves, black varnished shoes.